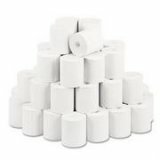 Fifty (50) new rolls of 2 1/4" x 85' thermal paper. Omni 3730, Omni 3730LE, Omni 3740, Omni 3750, Vx510LE, Vx510, Vx520 Non-Contactless, Vx570, and Vx610. Optimum T4205, Optimum T4210, Optimum T4220, Optimum T4230, Optimum M4230, T7Plus, and T7P-T (thermal). Lipman Nurit 2085, Nurit 3010, Nurit 3020, Nurit 8320, Nurit 8400, LinkPoint AIO, First Data FD50, and FD55.